Publisher: New England Botanical Club, Inc. 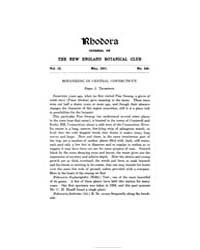 Description: Rhodora is a peer-reviewed journal of botany devoted primarily to the flora of North America. It has been in publication continuously since 1899. This peer-reviewed quarterly comprises 400-500 pages per year. Monographs or scientific papers concerned with systematics, floristics, ecology, physiology, paleobotany, or conservation biology of the flora of North America or floristically related areas will be considered.